Suicide is the second leading cause of death for Canadians between the ages of 10 and 24. The stigma associated with the topic of teen suicide makes information difficult to come by. And quite often the resources that exist are written for the medical community or adults in contact with teens (parents, guidance counselors, etc. ), not teens themselves. Existing resources also tended to be designed with overly positive messages and imagery – resulting in an even more alienated teen. 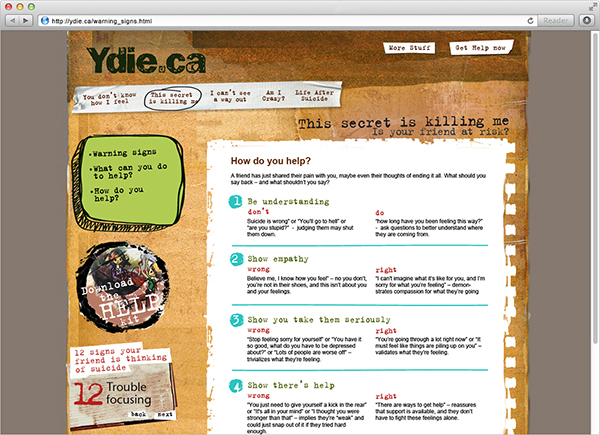 We built a bold, in-your-face site that speaks to teens in their language. The site’s goal is clear: prevent teen suicide through education and connection to partner agencies. Starting with interviews, student artwork, and focus groups, we came up with the name, designed and developed the site, put together print collateral, and worked on the launch roll-out and strategy. The site is ‘unstructured’ with overlapped images, textures, angles, and uneven edges. The colour palette contains darker tones and feels more serious. Font styles are reminiscent of scribbles and graffiti to give a sense of youth rebellion and non-corporate attitude. The result is a contemporary and industrial feel that teens feel comfortable with and relate to. Teen focus groups were used to provide feedback on design and content with overwhelmingly positive results. Original artwork complements the text and is used throughout the site. A school project sponsored by the Canadian Mental Health Association and the Peel District School Board was given to local high school students. Students created works that illustrated support, hope, and help. Used with the students’ permission, these pieces create personal and understanding imagery. 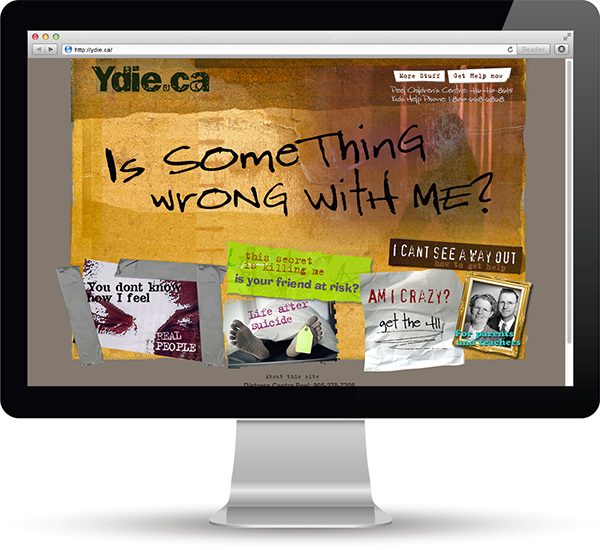 Ydie.ca is timelessly ‘cool’ without capitalizing on trends that would easily date the site and impact its function of relating to teens. 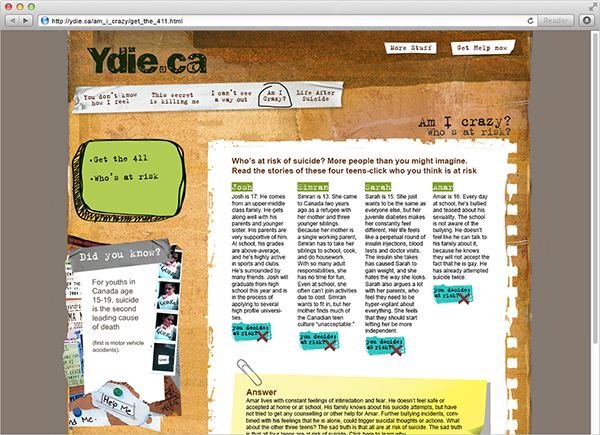 The creation of ydie.ca was a partnership project with CASPP and the Peel District School Board, and receives ongoing funding support from 108 ideaspace. We could talk about the number of pageviews or media coverage. Or the consortium of community agencies that now work more closely because of this project. Or we could talk about our firm’s ongoing sponsorship. Instead, consider the impact: saving just one life is worth it. Source: Canadian Psychiatric Association (2002), Mental Illness Awareness Week fact sheet.